The small settlement of Laya in northern Bhutan is one of the most remote places on the planet. Not only is it the northern-most settlement in the Last Himalayan Kingdom, it´s also the highest permanent town at 3800m (12,467ft) in Bhutan. The whole settlement has about 110 houses. As of now, Laya is accessible only by a two-day hike from the closest town, Gasa. However, this is changing fast. A jeep road is being constructed and it is scheduled to reach Laya within the next 3 years. Electricity has recently reached Laya. While I was enjoying a glass of Bhutan Highland Whisky (amazing) in one of the 4 bars in Laya, two electricians turned on power for the first time in the bar. That glorious moment was celebrated with a double shot of whiskey. As I said, two days of hiking are required to reach Laya. The hike is not too difficult, but the surface is incredibly muddy, and parts of the hike are infested with leeches. The monsoon season this year has been hard on the new road, and it offers no less than 30 landslides to scramble across, with some of them being very dangerous. I would probably not be writing this post if I didn’t have my walking stick. 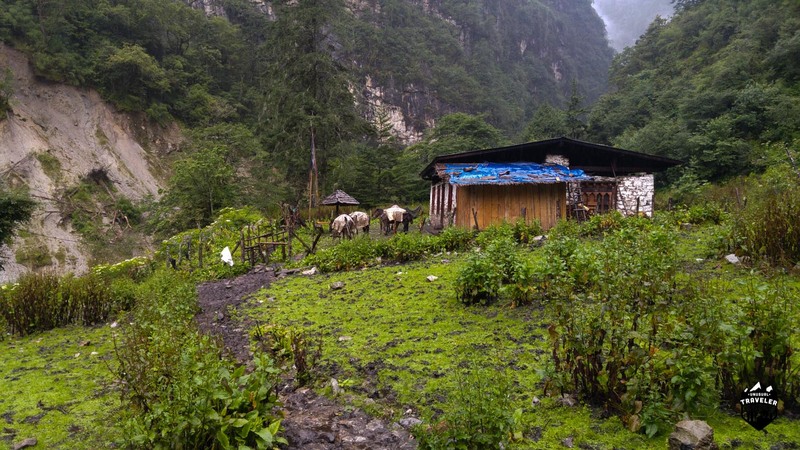 The Hike from Gasa to Laya is about 28km, and there’s a small hut that´s run by the Bhutan Tourism in Koina which offers basic amenities but it’s a great shelter. The journey from Koina to Laya takes approximately seven hours, an undulating trek but nothing too difficult. In about five hours you will you reach the Bhutan Army Camp, where they will check your permit. From the camp to Laya is a two-hour journey, up, up and up. When you finally reach the ancient gate to Laya, there is 10min uphill climb still remaining before you spot the first few houses in the village. This gate was previously the town limit, where they would chase unmarried girls who fell pregnant. 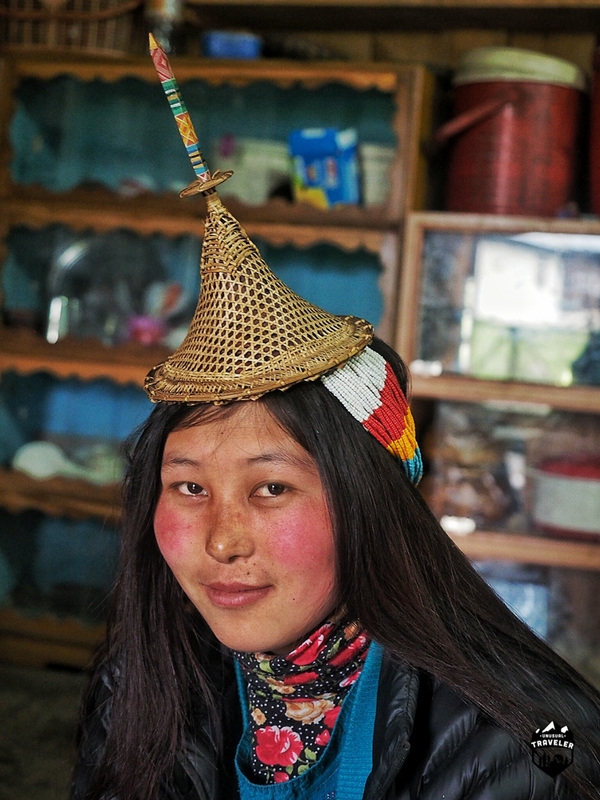 The Layap are an indigenous minority roughly 3000 in number. They only inhabit this small part of the country. Most of the people still live as semi-nomadic yak herders, spending time between the villages and the high altitude yak herding camps. However, these days a lot of the young men are also engaged in illegal trade with Tibet, noticeable beer sold in Laya is “Lhasa beer”. Most of the candy and other products here are Chinese. 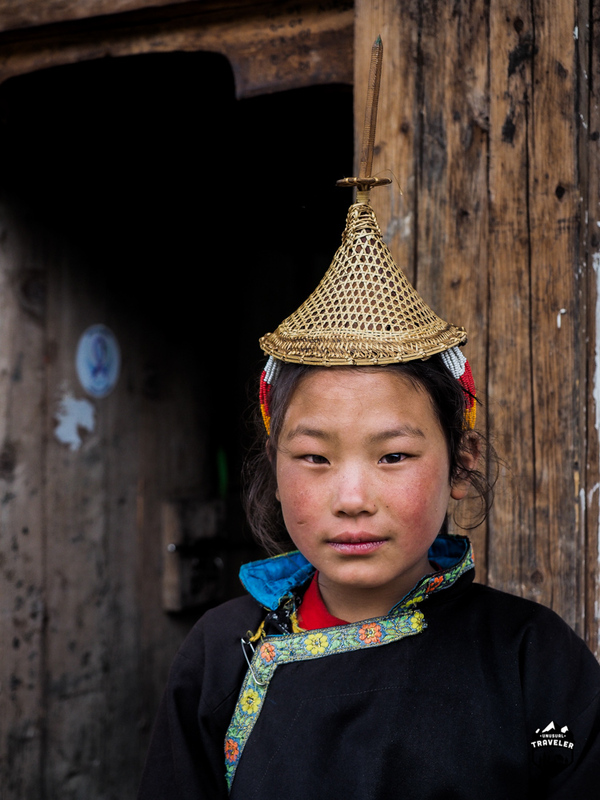 Due to this illegal trade, Laya is said to be one of the richest villages in Bhutan. 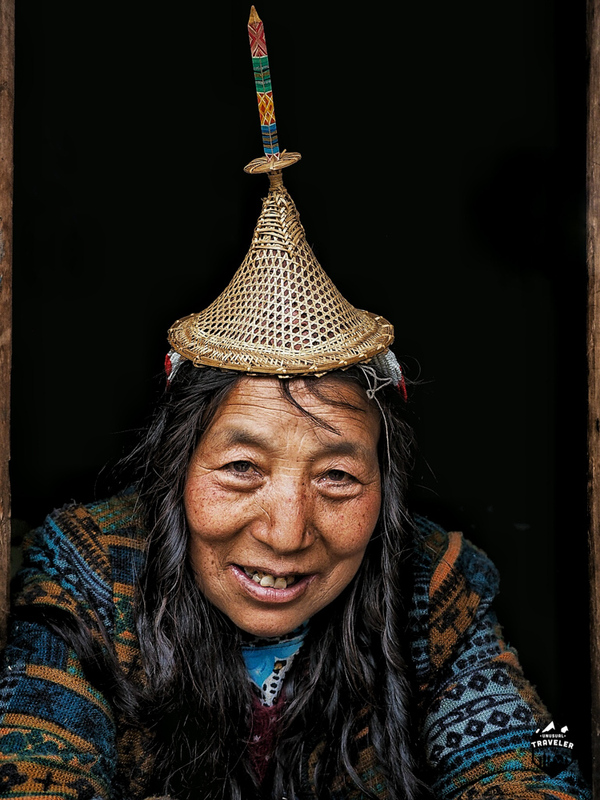 It is said that the Layaps have lived here since they were banished from Tibet in the 15th century and that the Layap women have used their distinctive hat, made of darkened bamboo strips woven together with a pointed top, even longer. I was told that the only one living hat weaver is alive today and that the younger generation is not interested in learning the craft. The future of this amazing hand-craft looks bleak as youngsters are more interested in modern technology. 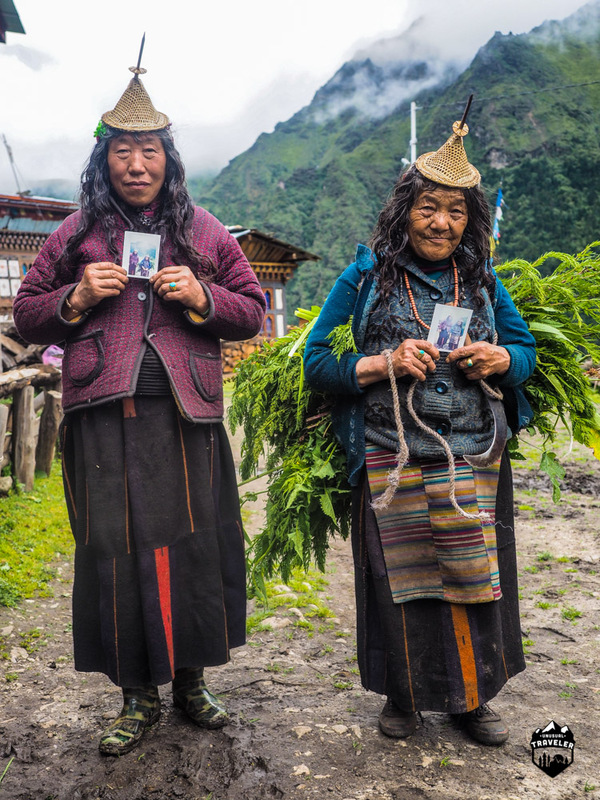 Two older Layap women posing with their Polaroid photo I have just given them. 2G internet connection has now reached Laya. You can see the younger generation are busy with their smartphones while the older generation still lives in a semi-nomadic lifestyle in the hills surrounding Laya. 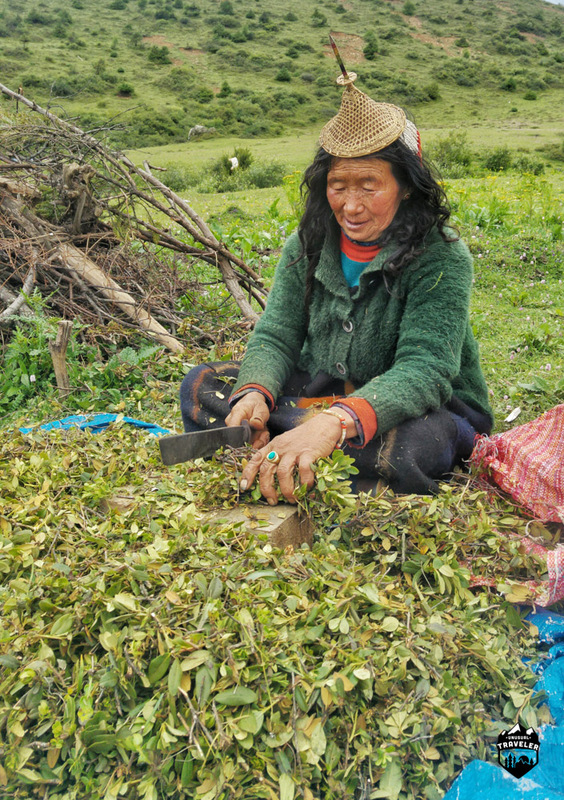 Their lives consist of chopping rhododendron leaf for incense or weaving traditional clothes. That said, the older generation has also adopted some modern style. There are no more black yak tents in the surrounding hills, these days they use the ugly blue tarpaulin to construct their tents. 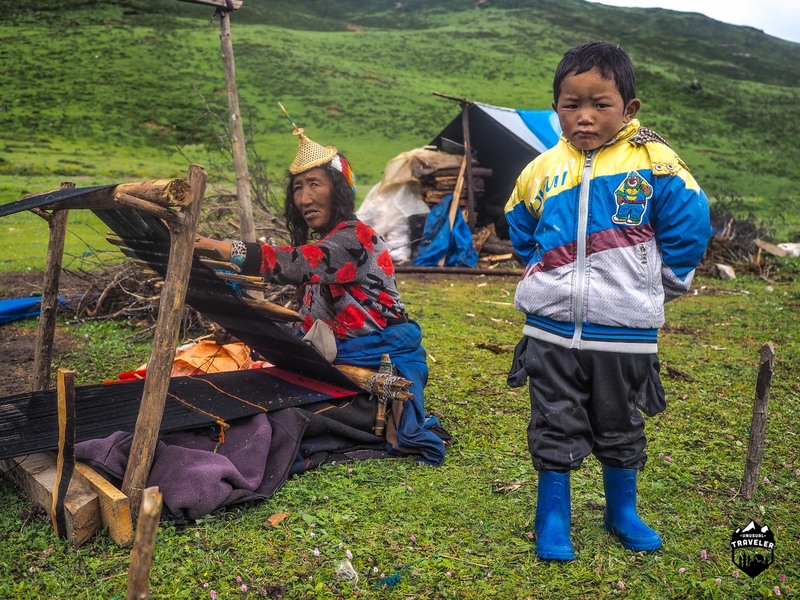 A nomadic Layap woman is weaving traditional clothes while her grandchild is looking a bit skeptical at the foreigner that just arrived at their camp. 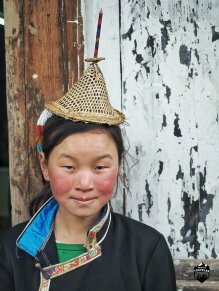 If you want to visit another Minority in Bhutan, read this great post about visiting the Marek group in far east Bhutan. 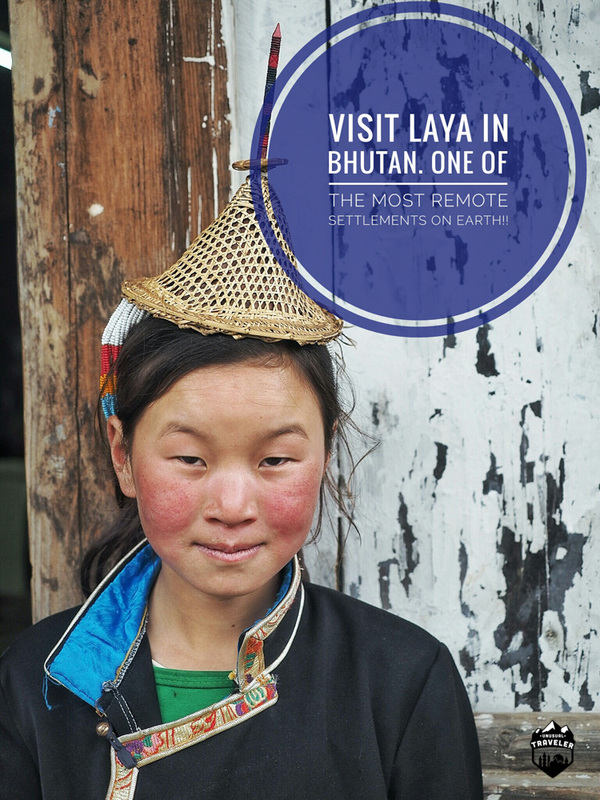 The small settlement of Laya in northern Bhutan is one of the most remote places on earth. Not only is it the northernmost settlement in the Last Himalayan Kingdom, it´s also the highest permanent town at 3800m (12 467ft) in the Kingdom. The whole settlement is no more than 110 houses. 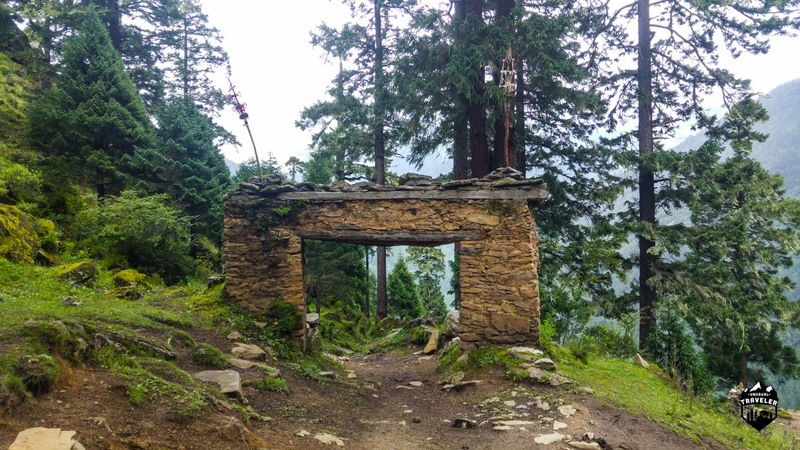 Laya is only accessible by a two-day hike from the closest town, Gasa. This looks amazing. Great, great pictures! Tho personally i gotta say that the hats looks a bit like party hats *lol*. Still Bhutan sounds like such a fantastic country. 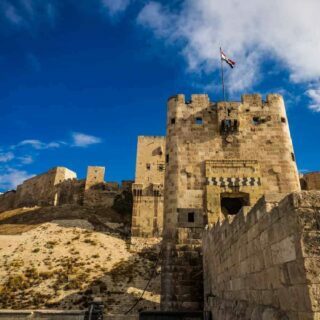 I so want to visit, but my dad doesn’t want to visit without my mum and well..she’s kinda not convinced yet! What a lovely experience you must have had. Your pictures and your write up speaks so much to say that. This looks a really idyllic and off the beaten track place. Must have been difficult to find your way there? I’m just wondering if you always stay in all the remote villages you vist. if you do, do you make your own tent? I have actually had a tent with me on most of my trips, but I have NEVER used it, I have always got invited to stay with locals in remote villages.